Last week, Apple Industries attended the Annual Meeting and Gala of The American Amusement Machine Association (AAMA) at the Chicago Renaissance North Shore. During the Evening Gala, Apple Industries gave an exclusive sneak peek at two new products, “Photo Studio Prism™” and “Print Budii™”. Both products will be officially launched at IAAPA in November this year. The Amusement and Coin-Op Industry Leaders were first introduced to “Photo Studio Prism™”, a compact new version of Photo Studio Deluxe™. Critically acclaimed for its state-of-the art technology, the World’s most interactive photo attraction has proven very successful in entertaining millions of customers in Family Entertainment Centers, Malls and Amusement Parks from many countries. “Due to its monumental size, the popular Photo Studio Deluxe™ could only be installed in very large environments,” said Apple CEO, Allen Weisberg, “ and following so many requests from our loyal partners and distributors, we decided to develop “Photo Studio Prism™”, a smaller and more compact version to fit within many more locations”. Apple also introduced “Print Budii™” to the Industry for the first time at the AAMA Gala. “Print Budii™ is the world’s first app-powered printing kiosk,” explained Apple COO Scott Avery. “This new addition complements our broad range of photographic products and will revolutionize the way of printing instant photos”. “Print Budii™ App enables customers to use their smartphone to access photo galleries and social media, then customize, transfer and pay for prints! All done by phone!” added Scott. Thanks to Apple, the AAMA guests had the opportunity to print memorable photos of the Gala from their mobile phones thanks to “Print Budii™”, and use “Photo Studio Prism™” to pose with their favorite characters as the Company also revealed a brand new licensed content including Universal properties such as “Trolls”, “Jurassic Park”, “Back to the Future”, “Fast & Furious”, just to name a few. 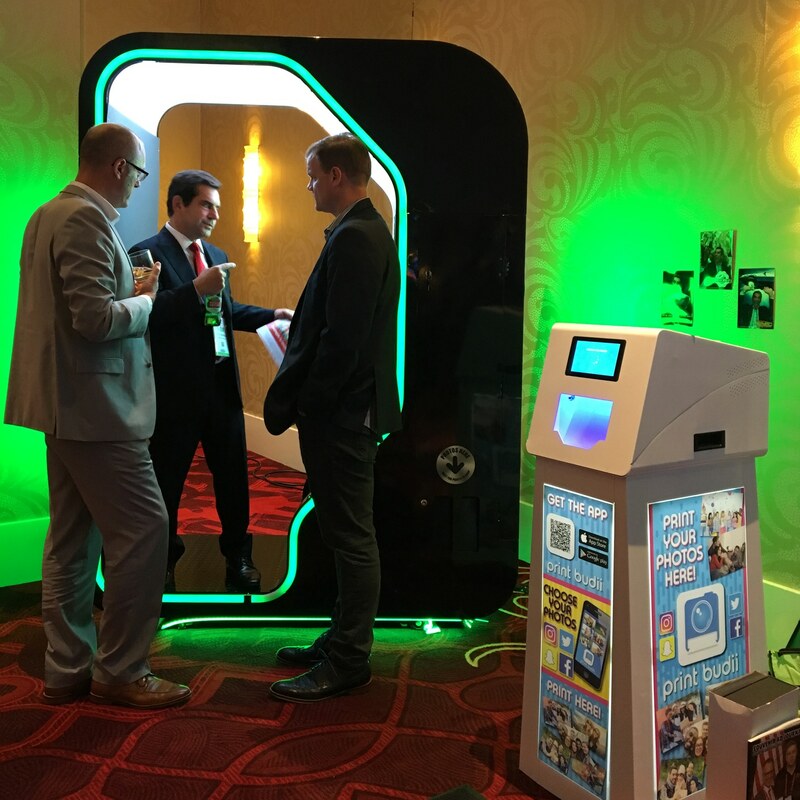 This is an exciting time for the World’s largest manufacturer of photobooths! Apple Industries have more surprises to come this year and will introduce additional new products at the IAAPA Attractions Expo 2018 in Orlando, November 13-16 2018. This year, do not miss Apple exciting stand 1600! The American Amusement Machine Association (AAMA) is constantly seeking out opportunities that support manufacturer, distributor, and operator and provides a vehicle for evaluation and communication. The association acts as a liaison between members of the association and others within the industry while monitoring developments, both within and outside the industry.